How can a microservice gain efficient data access to a shared database when implementing a dedicated copy of the shared database is not possible? Sometimes, the Dedicated Microservice Database pattern cannot be applied to establish a redundant, replicated copy of a shared database. Accessing the shared database in its current environment may be unacceptable for the microservice due to infrastructure limitations and performance and reliability fluctuations resulting from concurrent usage by other consumers. The shared database is isolated in a dedicated container and may further be encapsulated by a dedicated microservice with a generic data access API. The containerized database is independently managed and supported by the necessary infrastructure to scale with its required usage and to failover during fault conditions. Logical isolation of tables within the database may be further required to isolate datasets for specific microservices. The Leader Node Election pattern may be also applied to establish a master-less database model. The database is deployed in its own container, allowing it to be scaled and managed independently of the microservices or any other consumer programs. The shared database is deployed in its own container and encapsulated by a service API providing generic data access functions. 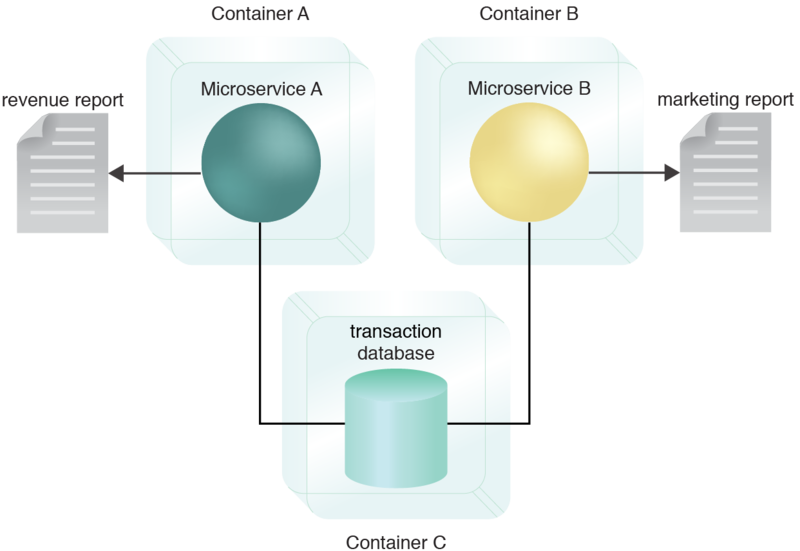 Microservice A and Microservice B are also stored in separate containers. Now the database and both microservices can be scaled and managed independently. This pattern can be applied by logically isolating database tables and can further be applied in conjunction with the Leader Node Election pattern, as explained in the complete pattern description.